"We're about to experience something we've never had before." "Things are going to happen." Bakker claims to read the David Wilkerson book "Racing Towards Judgment" on a weekly basis and believes it is helping to predict what will happen next. Bakker claims that some of the book's predictions have already occurred, even though it was written "several years ago." No Jim, that book was written in 1976 (42 years ago). "I believe with all my heart we're gonna see and hear and feel judgment of God. I believe judgment of God is coming, and it's coming right away. I believe we are going to see the big, final fulfillment in the next few months it's gonna begin probably within weeks ... we're gonna see something so dramatic happen." If Jim Bakker really wanted to preach the Gospel message, he would remind his audience that we all deserve the judgment of God, but thankfully, Jesus Christ took our sins upon Himself so that the judgment of God would never threaten us. Steven Kozar started The Messed Up Church; he is an artist, musician, blogger and stuff. Tammy Sue Bakker Sings "You Can Make It"
"Don't Stop Believing" On The Jim Bakker Show! Maybe somebody should tell these people that this isn't a worship song. The lyrics aren't even totally coherent: "Streetlights people, living just to find emotion..." What the?? Okay, okay, Mike Bickle wasn't on the show that day. But, Mike Bickle was recently on the Jim Bakker Show. He talked all about the "prophet" Bob Jones and a bunch of other weird stuff like he usually does. End Times Profiteering, False Prophets, Stranger Than Fiction, Worship? Dr. Michael Brown Guest Hosting Sid Roth’s Crazy Train "It’s Supernatural"
Dr. Michael Brown is once again lending his approval to the outer-fringe of the charismatic movement. He announced on Facebook that he’ll be guest hosting on Sid Roth’s crazy train show It’s Supernatural, and will be interviewing his good friend Jonathan Cahn. Sid Roth’s show is a crazy train going full speed ahead to Crazyville. The show’s introduction sounds like something you’d hear on a paranormal research show. Listen to the introduction below. The strange world of the supernatural? Is this a psychic research show, or maybe a ghost hunting show? The introduction doesn’t even sound distinctly Christian. Yet you see the camera panning right to Dr. Michael Brown as the voice over talks of the strange world of the supernatural. Why is Dr. Michael Brown giving any credibility to Sid Roth’s show? Remember when Jeff Jansen was a guest and told about the angel who gave him a 50 carat ruby from heaven? This isn’t a simple matter of a silly thing to laugh at. Roth and those like him direct our attention away from the simplicity of the gospel. Instead, they focus on soul destroying things like 50 carat rubies supposedly given to people by angels. Dr. Michael Brown has a bad habit of giving his credibility to the craziness. Remember when Jennifer LeClaire came out with her Sneaky Squid Spirit, and Brown went out of his way to attempt fitting it into the realm of acceptable orthodoxy? 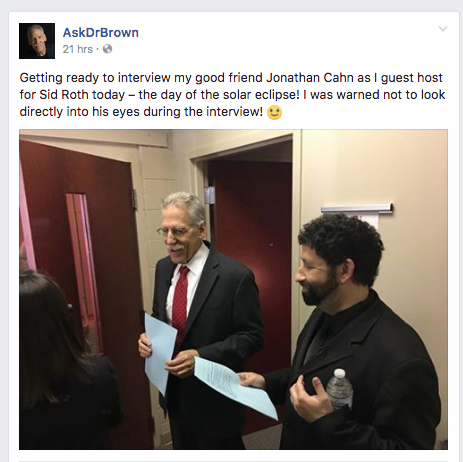 Once again he hands his credibility to the crazy by hosting the show and interviewing failed shemitah and blood moon “specialist” Jonathan Cahn. Dr. Brown at this point is addicted to injecting his perceived credibility into the crazy wing of the charismatic movement. And ALL of these false teachers are making giant piles of money off of the gullible. Dr. Brown needs an intervention ASAP. Jennifer "Sneaky Squid" LeClaire watches in utter confusion as the song begins; notice her refusal to join the clapping. Perhaps the Sneaky Squid Spirit is at work here?